Leonard, who died in 2000 at the age of 89, was a descendant of a pioneering farming family that settled in Santa Clara County in the mid-1800s. He was a fruit grower whose orchard later became Cupertino’s Vallco Park development, and he was a major force in the incorporation of that city and its post-agricultural growth. Because of his longtime interest in agriculture, Leonard had visited Salinas as well as Hartnell College over the years, according to Bill Hyland, longtime friend and business associate. The Leonard estate has made contributions to 24 charitable organizations, including Hartnell, Hyland said. All of the organizations reflect his longtime interests-California history, land conservation, agriculture and the arts. At the time of his death, Leonard was president of the Leonard Company, a property development and management firm at the Vallco Financial Center. A bachelor all of his life, Leonard was a major landowner in Santa Clara County. His favorite property was his facility on Llagas Road in San Martin (between Gilroy and Morgan Hill), where he stored and maintained his collection of farm machinery, tools, photographs and other memorabilia from the Santa Clara Valley’s agricultural past. Born in San Jose, Leonard grew up on his family’s 200-acre farm. John, his father, pioneered diversified irrigation farming and packed fruit under the John Leonard label. 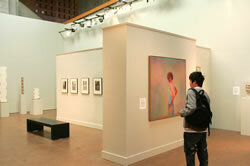 The Hartnell Gallery’s annual exhibition schedule includes prominent artists in all areas of the visual arts. Some of the artists are known only in the West, but most have exhibited nationally or internationally. All exhibitions are free and open to the public.